Even though your teeth are made out of the hardest material in your body, they can still decay and become damaged. If this issue continues, it could expose the sensitive inner portion of your tooth, causing even more serious problems and pain in your mouth. At Jacksonville Dental Specialists, our team uses custom-made dental crowns to restore your teeth back to their natural beauty and function. Read on to see how these life-like restorations can improve your smile. 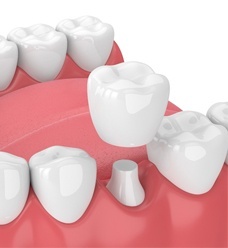 Dental crowns are prosthetic caps that are designed to cover the entire visible portion of your tooth. This allows for the restored appearance of your smile, but it also restores your biting power and strength. Unlike other restorations, dental crowns in Jacksonville are permanently bonded to your tooth, allowing for a long-lasting and stable restoration. 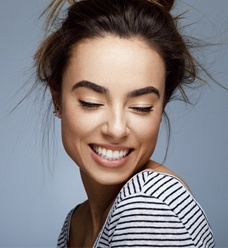 Crowns can be made out of various types of materials, but we use high-quality ceramics to deliver you a restoration that looks and feels like your natural smile. 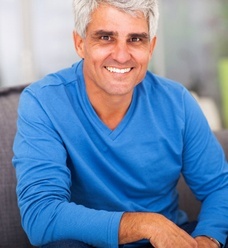 If it sounds like you could benefit from restoring your teeth with dental crowns, contact our office today. One of our highly-trained dentists will examine your mouth to provide you with a personalized treatment plan. Once Dr. Nawrocki or Dr. Aguila decide that a dental crown is the best solution for your decayed or damaged tooth, they will clean the area of any decay and begin the placement process. They will remove a small amount of tooth enamel to accommodate your restoration and then take impressions of your smile to create a customized crown that matches your natural teeth. You’ll be given a temporary crown to wear until your permanent one is fabricated, then you’ll come back to our office where we’ll permanently place your dental crown. Crowns can last a lifetime, but there is still a chance that they can fallout. However, with proper care, your dental crown in Jacksonville can give you at least 15 years of beauty and strength. To ensure the success of your dental crown, maintain daily brushing and flossing and visit our office biannually for dental checkups and cleanings. You should also avoid chewing on any nonfood items because they can crack your crown (and your natural teeth).